I never realized that I spoke a foreign language until I moved to Boston. I am from rural Idaho and knew on an abstract level that I had a twangy accent, but I never thought that it made me indecipherable. Humph. Within moments of my first telephone call with my future husband, he was twittering about the "git"s and "agin"s. Luckily for me, he found it charming and didn't tease me too much about it. After I moved out to Boston, I soon grew used to the puzzled or shocked expressions I received whenever I opened my mouth. For awhile I worked at a bank. Once when a mother came in with her young daughter, I held out the basket of treats and asked if she'd like a sucker. The mother recoiled as if I'd slapped her. My co-workers barely held in the explosion of laughter until the mother and daughter cleared the front door. Apparently they are called "pops" there. A "pop" is something I consume with a hamburger and french fries, but fine. I may have had a millisecond pause to translate every time I held out the treat basket, but I never made that mistake again. This quilt is made in honor of the first time I opened my mouth and shocked my brand-new husband. As we sat down to dinner, I apologized about the mess in the kitchen. "It will take us forever to clean up," I said, "I've got stuff spread from hell to breakfast in there." I knew from the look on his face that I'd gone and said something outrageous again. Luckily for me (again), he is a great connoisseur of colorful euphemisms and now uses that particular one as often as I do. I sketched out a road map for this quilt on graph paper before I started. It is helpful for me to visualize where design elements are before I begin so I can just have fun with the piecing and not over think too much. I approached this like a giant log cabin, beginning with a center unit and then adding slabs of piecing to build outward. Once I had a design framework, it was easy to let the improv piecing just happen. In addition to its title, I can see a lot of my humor in this. I accidentally pieced a skull into my "Hell" quilt. I had a good laugh at that one. I had also planned a series of different elements of piecing to help pull the eye through the quilt and I was concerned that I hadn't emphasized the top piece enough, so in the next row I added to the quilt, I made some arrows to point at it. Problem solved, Jill style. Ha! The worst part of this quilt was the number it did on my sewing room. I once taught with a woman who had a sign on the door of her first grade classroom that said "Learning is NOISY." Well, improv piecing is MESSY. Every horizontal surface was littered with snippets, thread (I used linen blends, chambray and peppered cotton which all shed thread like crazy) and little triangle pieces from constructing the flying geese units. In the spirit of cleaning up, I made a bonus mini with most of the little scraps that were left over. I pieced the snippets into thin strips and sandwiched them between two triangles. I squared the units to 2.5" and pieced them together in rows. I love the movement that emerges. I would like to make more of these someday. Maybe another time when I should be cleaning up? Taking the pictures of this quilt was definitely an adventure. 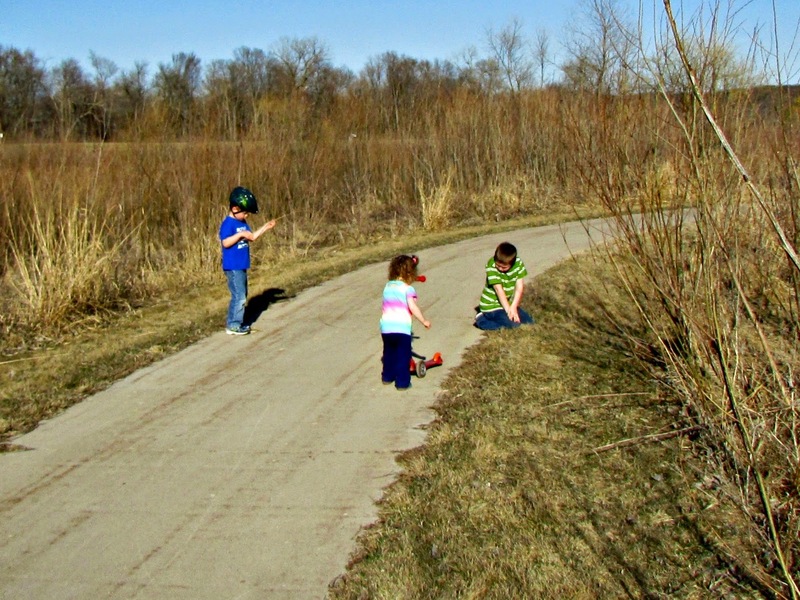 We took our kids out to a nature park that we love on a warmish day. Unfortunately it was warm and windy. In some of these pictures, my oldest son is sitting on his dad's feet holding the quilt down. Son #2 rode his scooter and our just-turned-two year old daughter waited not so patiently in her stroller. I looked up from the camera in surprise to see her sprinting down the path. Little Houdini had gotten out of her stroller while leaving her securely fastened seat belt still securely fastened. We put her back into her seat, under protest, and sat back to watch. She slipped her arms out from the shoulder straps, placed her hands on the seat of the stroller and used it like a pommel horse to lift her legs out of bottom straps. Thirty seconds, tops. We decided that any little girl that creative and enterprising deserved to run, so we let her. It didn't hurt that she ran down the path shouting "agin" with relish and triumph. That's my girl! This quilt top measures at 54" x 66." There you go with winners in each of the three categories! Thanks for such a nice compliment, AnnMarie! Doing 3 Marsala quilts has been a great way to try some new things. I can honestly say that I like Marsala! I grew up calling them suckers too. We moved to the East coast and all of a sudden pop was soda. Your story cracked me up! Your quilts are wonderful and I was one who did not like Marsala. You made it look great! Tonic, down cellar, bubbler...I was so confused!!! I could totally get on board with a chicken parm grind-ah, though. This is spectacular and I have the utmost respect for your improv skills! You've managaed to take a mundane (IMO) colour like Marsala, and compliment it with colours that bring it to life. Congratulations! Thank you! I agree that Marsala is a neutral. Although by itself it can look drab, it elevates its companions. The more I've used it, the more I like it. wowie! I love them both!!! Thanks for reading about them and taking the time to comment! I have a feeling that one of these might show up for the OCQG solids challenge...in which case I'm not even going to bother to start making mine! These are really amazing, Jill, and I agree with Molli: you've given a dull color an entirely new lease on life. Just fantastic! Thanks! I used a lot of peppered cotton, shot cotton and even some interweave chambray in this. Given a choice between doing my own thing or arguing about the definition of a solid...yeah. I'd start working on your challenge quilt. 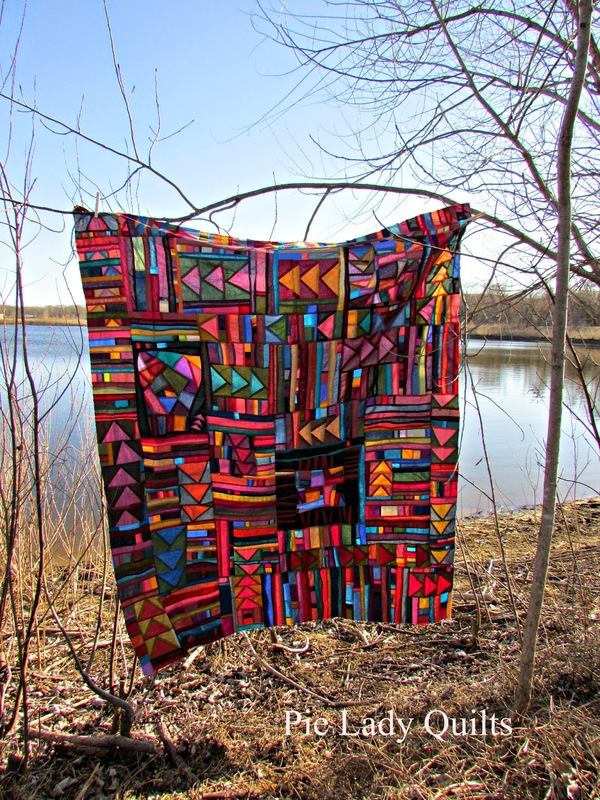 love your quilts ! all of 'em ! When I was reading aboot ( yes, I'm Canadian) all the different words - I decided it must be a east vs west thing because we say sucker & pop here in the CDN west too. do you say git 'er done ? I gotta go git 'er done ! Canadian, eh?? Colleen, I don't think I ever finished a word ending in -ing until I was at least 21. And, as much as I love Larry, I can't say that I use his phrase in anything other than a direct quote. I don't think I could pull it off. I love your quilt!!! It is so interesting and fun. Thanks Cathy. I have so much fun while I sew...I am glad that it shows in my quilts! 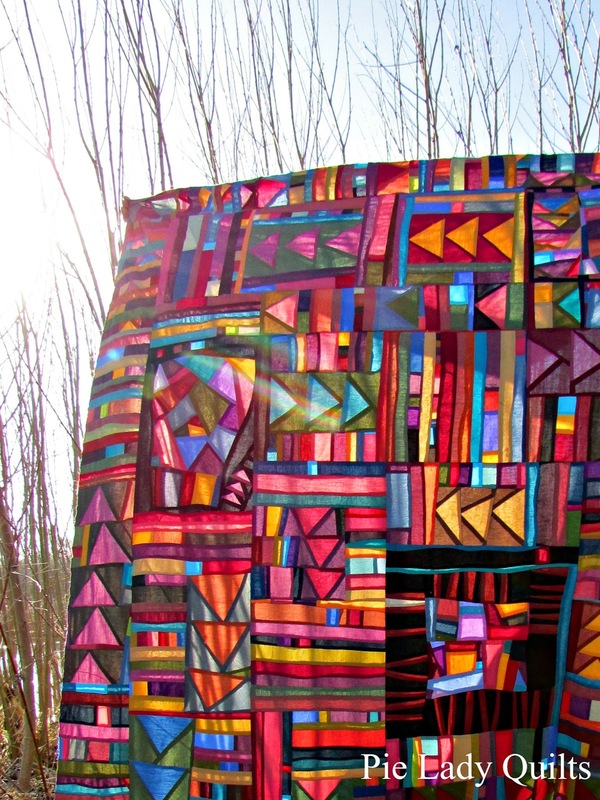 Wow, I love this quilt, I mean, both are lovely but the large one will be an Art Quilt, thanks for sharing your work. Thanks, Alejandra! I am glad you love the quilt. It may have been a messy process, but I enjoyed every moment of making it! 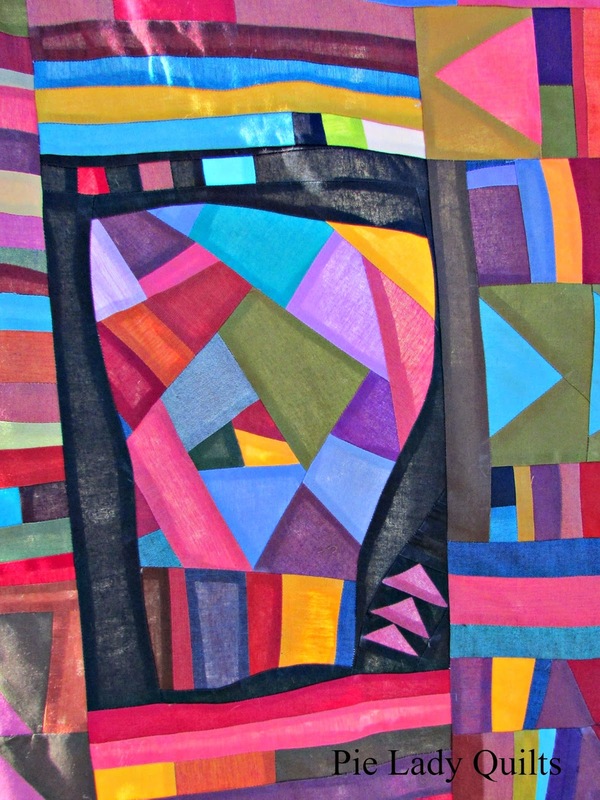 I love your large art quilt. What a treasure! I love it! Huhmm... I should add that expression to my vocabulary. Since I have an accent (Brazilian by nature, American by choice), I am soooo used to people looking at me funny! Ha! I think you'd probably make it sound exotic and mysterious. I sound like a hick. In any case, please use the phrase! The world needs more things to smile at! That is a spectacular quilt! It looks like stained glass and it's stunning. But the giggle of the day goes to your daughter - I love her Houdini antics and I rather suspect she might get on with my own two year old daughter who is similarly a master of escape! If your daughter is anything like mine, then she must be bright and lively and full of sass. Any difficulties now will be well worth it if they grow up to be strong, confident women! Thank you! My Idaho Talk seems to come out more when I'm upset. I think my husband is happy not to hear it too often. Great expression! 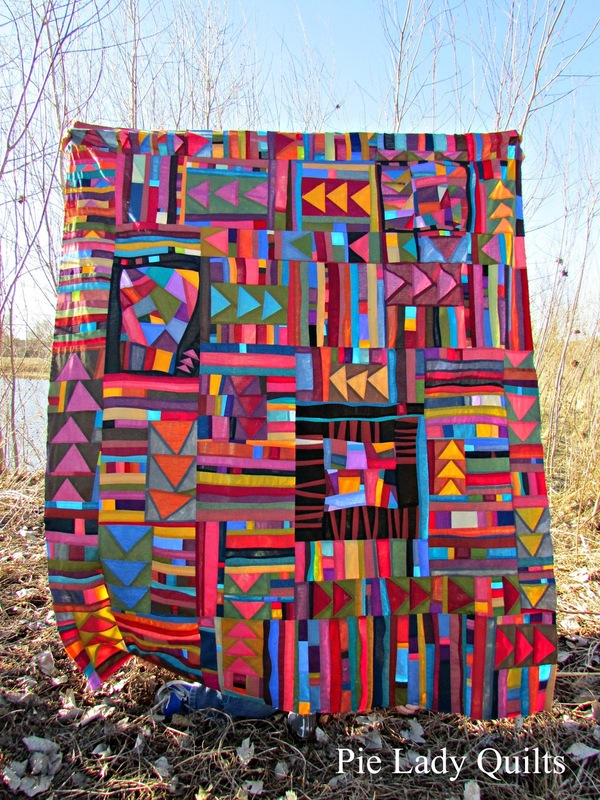 Your quilts are beautiful - love it when the scraps come together in such an interesting way. Sometimes I think scraps are the funniest to work with because you can play without pressure. I seem to freeze up when it comes time to cut into precious yardage. With scraps an unsuccessful experiment only wastes your time, not your time and money. Love your quilts and your sense of humor! Thank you! Laughing is my second favorite pastime. Combining the first and second is even better! I love the quilt and the story behind the quilt name! Thanks, Cheryl. 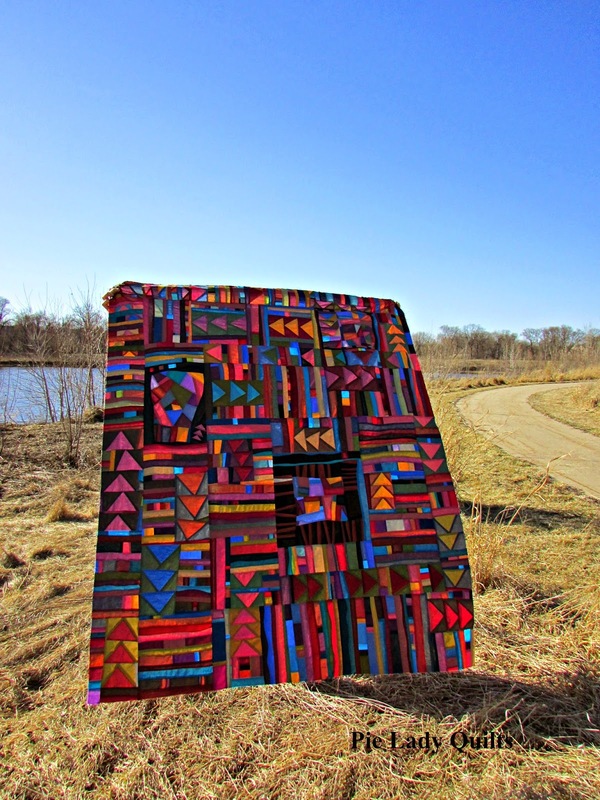 Knowing the story behind a quilt makes me enjoy the quilt even more! Definitely a winner at the OCQG and wherever you enter it. Thanks so much, Phyllis. I am so happy you liked it! You'll definitely be seeing it in person in about a week. Love your quilts!! So colorful and fun! Accent, schmaccent. I live in Nashville, where the most prominent bumper sticker (besides the political ones that I always choose to ignore) says something like, "twang twang, whine whine." :) My husband's family is from just south of the Ohio River in Kentucky, but they have the river accent - anytime his uncle saw me, he would ask me to say things just so he could hear how I talk, and I lived only two hours south! :) It's a beautiful quilt, and yes, improv is messy! The river accent! That's awesome! Drive on up to Iowa and we'll talk river to farm. Outstanding. Really! This is a show stopper. I'm from the Boston area and although I no longer live there I still get funny looks when I say certain things! Keep your you in your speech, it's good for all of us! I'm from rural South Australia and probably speak in euphemisms and metaphors too. We say things like get er done, Satdy etc instead of Saturday, and use colourful descriptions. A big mess is from a-hole to breakfast time! 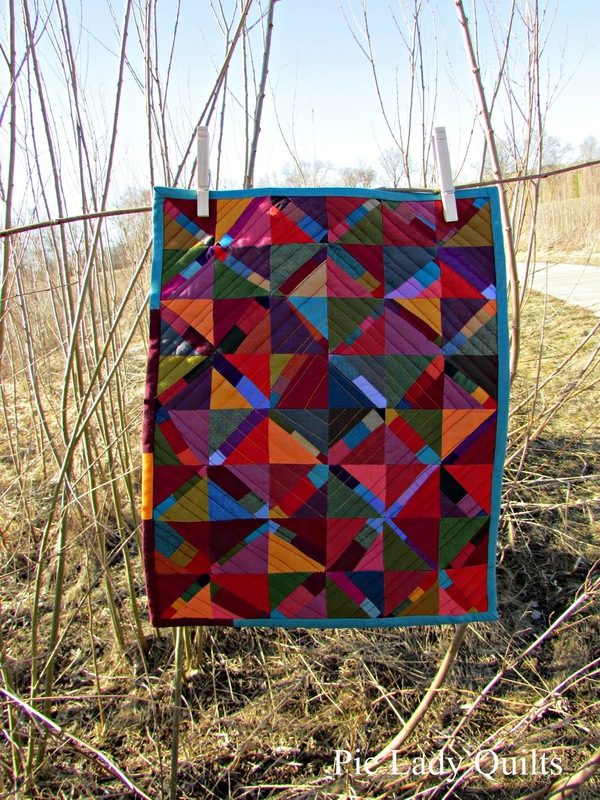 Great improv quilt, and you've done Marsala proud to make it look not so blah. Wow, Sarah. I'm going to be hard pressed to pick which one I like best. "A-hole to breakfast time" might just be unbeatable!!! I do genuinely like Marsala. I suppose that helps. Thanks for your comment! 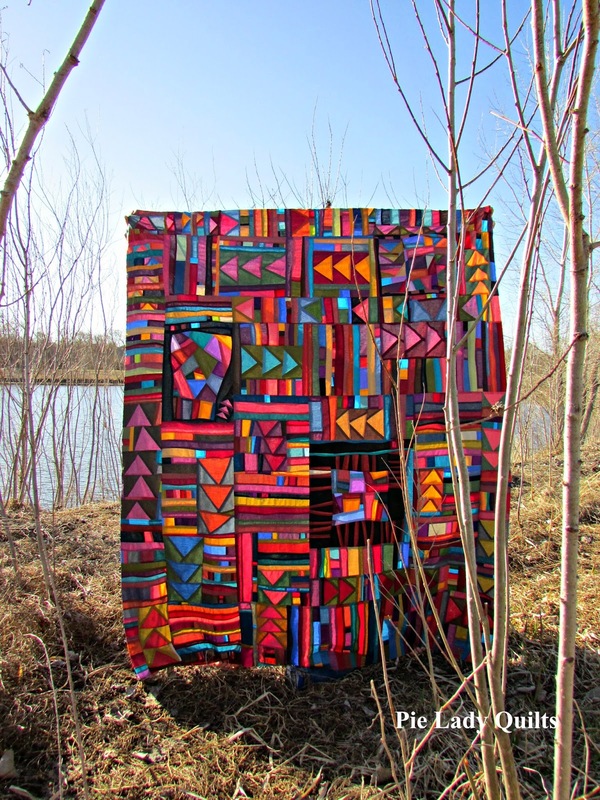 What a great quilt, and a funny story to accompany it. That, and the scenery, means that you get my vote in the Marsala challenge. I haven't been brave enough to attempt anything like your quilt yet, but one day. Funny story from me - when I was 13 I move from one end of New Zealand to the other. Not very far in USA terms, but we also have regional accents. School kids thought I had come from England, UK because I spoke "posh". I very quickly changed my way of talking, and years later visitors from Australia would say that I had the strongest NZ accent. What we do to fit in!! Thank you Wendy! I haven't been brave enough to attempt anything like your quilts, either! Ha! I love to go out to that lake...it's called Waterworks Park and it has the most beautiful scenery and wildlife. I will have to take the finished version of this quilt out there for some more pictures. ANYWAY. About this quilt. Oh how I love thee, let me count the ways. Improv amazeness, check. Marsala glue, check. Solids a-plenty, check. Lines and triangles oh my, check and check. Seriously this thing is wonderful and I don't even know where to start on it. I could spend a long time looking at it and I still probably wouldn't see everything! Love. It. Thanks Anne! No, Boston was a two year experiment for us and then we moved to Iowa where we get funny looks for NOT saying "warsh." Congratulations on a win! This was my 22-year old son's pick in the tops only category. Great taste runs in the family....? :-) Thanks again, AnnMarie. Thank you, Teje. I really enjoyed working with these colors and have since added to my solids stash considerably. I hope to do many more quilts like this. Thank you, Julie! That was such a lovely thing to hear! Come back again, but BE CAREFUL... we may just turn you into a quilter! 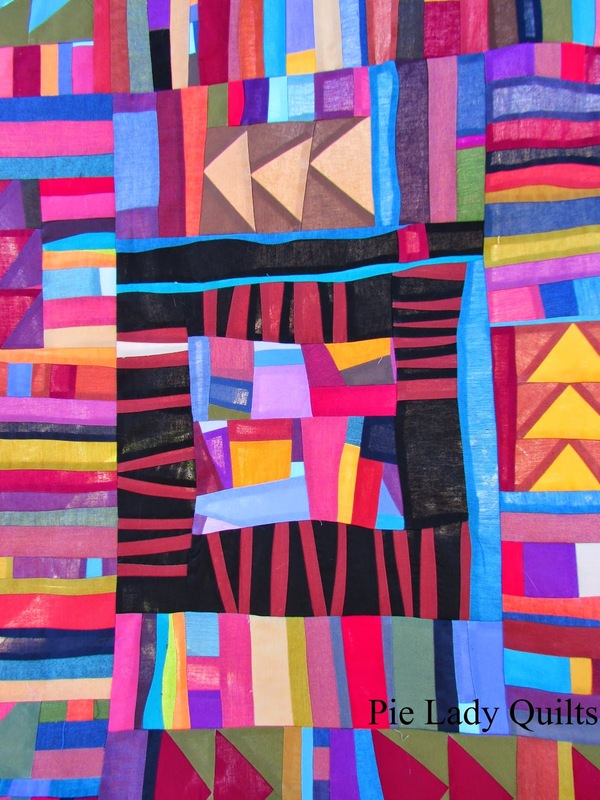 Your quilt is beautiful, and so lively! Thank you! Marsala isn't as boring as we all feared! Thanks for your comment. Cool quilt and great story. I spent a year teaching in Colorado, from New Zealand. I spent the first 6 weeks having to write most things on the board because they didn't understand a word I said. They loved me saying corridor rather than hall, and rubbish in the bin rather than trash in the can! Thank you Karyn! I hope you kept saying "rubbish" too. If I could get away with saying it, I probably would.